GateGuru, the iPhone app that’s been called the Yelp for Airports, is expanding to Android phones today with the launch of a new app. The company is also announcing that it has raised $800,000 in funding from Brad Harrison, Allen Morgan, Chamath Palihapitiya, Tom Glocer, Thomas Lehrman, and Matt Daimler. 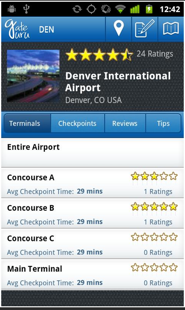 GatGuru’s free Android App allows travelers to locate food, shopping and service options within any airport as well as import their itineraries from TripIt and Kayak, and submit and view security wait times. Currently the app has over 400,000 users, and now counts 25,000 reviews and tips from fellow travelers. CEO and founder Dan Gellert says that GateGuru is seeing a growing number of business travelers using the app, especially as a centralized place to find security wait times and access itineraries. While TripIt and Kayak dominate itinerary management on the go, GateGuru provides a useful, centralized resource for airport information. It’s not surprising that business travelers find the app so compelling.